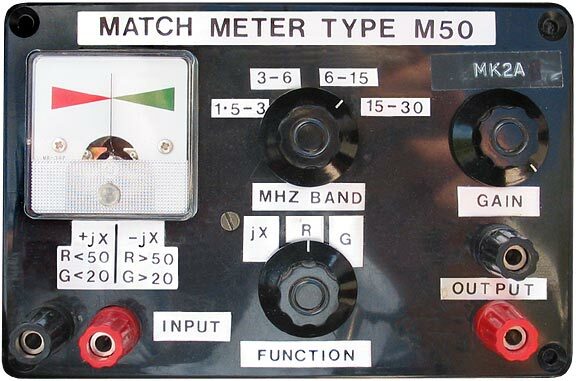 The "Match Meter" was invented by Nigel Williams, G3GFC in about 1980. It is a three-function RF bridge, giving null indications of resistance, conductance and phase error, which can be inserted into the line between a radio transmitter and an antenna matching network (AMU or ATU). The device is intended to provide a means by which HF amateur radio operators can use an impedance matching strategy that was first outlined in a paper by Underhill and Lewis in 1973 . The method involves assigning the impedance to be matched to a region of the impedance plane or 'Z-plane', and thereby determining the necessary AMU adjustments. The method is vastly superior to the usual SWR-monitoring approach because it indicates the order in which AMU adjustments should be made, and the direction in which the impedance matching elements should be adjusted. Adjustments made according to this scheme are also naturally optimal in terns of efficiency; 'false' solutions (which couple an unnecessarily large proportion of the transmitter output power into the matching network losses) being precluded. 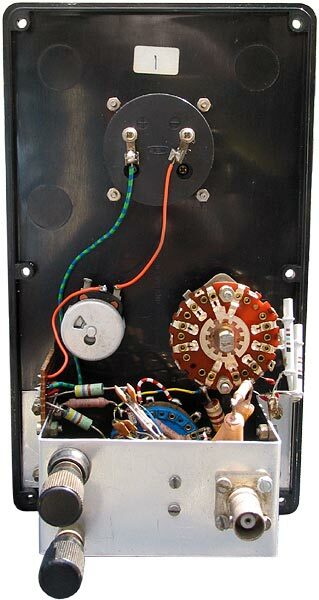 The M50 Match Meter (for 50 Ω systems) was originally conceived as a commercial product, hence the patent application that is reproduced below. The instrument however, like so many good ideas, was never marketed, and existed only as a small number of prototype units. SERT Journal, Vol 8, Sept 1974, p183-184. Reprint of paper in Mullard Research Labs Annual Review, 1973. Introduces the idea of using phase, resistance, and conductance for unambiguous adjustment of the matching network in automatic antenna tuning systems. Describes the matching process using Z-plane diagrams, and operations involving lines of constant resistance and circles of constant conductance. 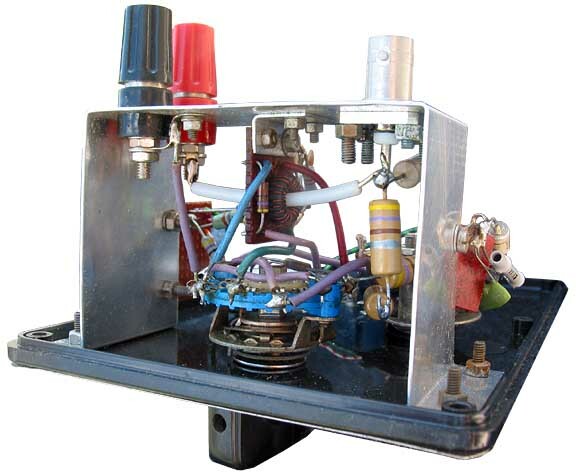 The M50 is a "little black box" that can be inserted in the line between the transmitter and the AMU and used to determine the Z-plane region in which the impedance to be matched lies. If you already know roughly where to set the AMU controls for a particular frequency of operation, using the M50 will probably be slower than your normal procedure; but the M50 will give additional information about the antenna system and will quickly identify any bad settings that you might previously have adopted. The real usefulness of the M50 therefore, is in creating the reference table of AMU settings that ought to be produced every time a multi-frequency antenna system is installed or modified. This can be a very time-consuming job, and the M50 will provide an unambiguous set of solutions. The M50 will also tell you whether you should use a step-down or step-up balun or unun; and it will give subtle hints regarding the losses that may be occurring in any AMU inductors.. The main control of the M50 is the Function Switch, which is used to select which of the three possible measurements is to be made. "jX" denotes reactance, with the meter indicating zero when the reactance term is zero. "R" denotes resistance, with the meter indicating zero when the resistive term is 50 Ω. "G" denotes conductance, with the meter indicating zero when the conductance term is 20 mS (20 milli Siemens). The MHz Band Switch is used to select a network giving 90° phase shift for the jX measurement. Using different networks for different bands improves the accuracy of the measurement. This instrument has been designed for use over the frequency range 1.5 to 30MHz, and is intended primarily for use between the output of a transmitter and the input to an antenna or antenna matching unit (AMU / ATU). It will indicate what type of impedance is presented to it, and from that one can deduce what adjustments must be made either to the antenna or to the AMU to convert the effective load presented to the transmitter to 50 Ω resistive. The instrument does not itself include any form of AMU and hence cannot perform the actual matching, but permits rapid and unambiguous adjustments to be made to an AMU, resulting in a true match. It is designed for connection to unbalanced impedances, such as a random length wire aerial and earth, but can also be used to measure balanced impedances, such as a balanced antenna feeder, provided some form of balanced-to-unbalanced (BALUN) impedance converter is used between the balanced impedance and the output of the M50. The M50 requires only a few watts of RF power for satisfactory operation, hence while it is being used the transmitter should be set to low power output either by internal adjustment or by the use of an external attenuator. When the AMU settings have been determined the M50 should be removed from circuit. • A Faraday shield wouldn't go amiss. It should be earthed on the TX-side of the transformer core. • The 4k7 resistor and 1 nF capacitor in each of the Mk1 detectors is redundant. These parts are omitted in the Mk2. • A metal box might not be a bad idea. • The phase bridge requires no calibration. (the amplitude of the quadrature component does not affect the null condition). • The R and G bridges have no frequency compensation. Calibration (with a 50 Ω resistor connected across the antenna terminals) is by adjusting the upper voltage-sampling arm (3 resistors adding up to about 1130 Ω). A Cermet pot. giving about ±10% adjustment would facilitate matters. 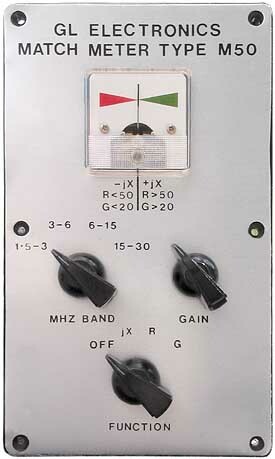 The meter of the Mk2 deflects to the left for positive jX. The authors are to be recognised when citing or making extracts from this document. British Patent Application No. 8321271, 9th Sept. 1983. 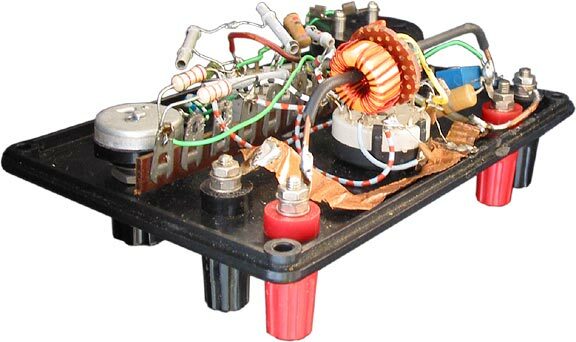 This invention relates to instruments used to facilitate the conversion of an unknown impedance to a desired value of resistance, such as may be required when a radio aerial is supplied with electrical energy from a radio transmitter. The impedance of a radio aerial varies according to its design and the radio frequency at which it is used. In order to effect a maximum transfer of power from a radio transmitter to such an aerial it is common practice to convert the impedance of the aerial, which in general will contain both resistive and reactive components, into a pure resistance of some convenient value. Such values may be typically 50 or 75Ω. This conversion is commonly carried out by the use of a network of two or more reactances, either of which may be capacitive or inductive, and the process is known as matching the aerial to the transmitter. In order to indicate what values these reactances should have to carry out the matching process it is well known to employ three types of detector, which compare voltage phasors derived from the radio frequency voltages and currents flowing in the aerial. Such detectors are commonly located at the interconnection points between the various reactances of the matching network. and between the network and the aerial. Frequently the outputs of these detectors are used to indicate to a servo control system the way in which the reactances must be changed in order to bring about a match, and the servo system will then cause the required changes to take place, automatically matching the aerial to the transmitter. According to the present invention there is provided a simple instrument which may be manually switched to provide any one of the three detector functions previously referred to, and which will visually indicate whether the criterion for the function selected has been reached, or whether the figure attained is less than or greater than the criterion. The three detector functions are listed below. 1) To indicate whether the impedance to which the instrument is connected contains a reactive term or not, and if so, whether it is positive or negative. 2) To indicate whether the impedance to which the instrument is connected contains a resistive term less than, equal to, or greater than the value of resistance chosen for matching purposes, for example, 50Ω. 3) To indicate whether the admittance to which the instrument is connected contains a conductance term less than, equal to, or greater than the value of conductance chosen for matching purposes, for example 20 milli Siemens in the case of a matching resistance of 50Ω. By noting the indications given by these three detector functions and comparing them with a given set of instructions an operator may determine how to vary the matching impedances so as to convert the impedance of the aerial to the required value of resistance and zero reactance. 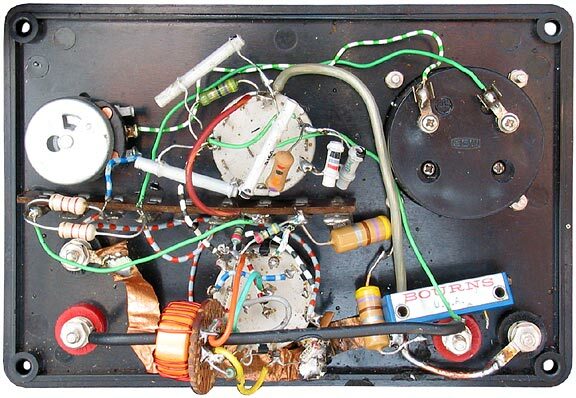 Although the conversion of the impedance presented by a radio aerial has been described by way of example, the instrument may equally well be used to facilitate the conversion of any impedance from any source to a pure resistance of some desired value. A specific embodiment of the invention will now be described by way of example with reference to the accompanying drawing in which Figure 1 is the circuit diagram of such an instrument. Switch S1 is used to select the required one of the three aforementioned functions, and also has an off position in which the secondary windings of transformer T are short circuited. The meter A carries a scale having its zero indication at the centre, and zero is indicated when the criterion has been met for the function selected. If the criterion has been exceeded the meter indicates to one side of zero, or if the criterion has not been reached, the meter indicates to the other side of zero. Variable resistor R4 is used to vary the sensitivity of the meter A, and the ratios of the resistors R1, R2 and R3 are determined by the required values of matching resistance. The switch S2 selects capacitors C1 to C4 according to the frequency range in use. The transformer T is a current transformer having two secondary windings.